Practically the entire fifth generation fighter ideology has come to fruition in the shape of the Su-35S. This gives Russia the potential to set about creating a sixth generation combat aircraft ahead of all the other nations. The advanced front line aviation complex PAK FA (the T-50) is completing its compulsory test phases successfully. The production fifth generation fighter is expected to enter service with the military from 2017. Meanwhile however front line units are already being equipped with an almost exact counterpart to this aircraft - the Su-35S multi-role fighter. The point is that along with creating the virtual fifth generation fighter concept - from the very beginning it has been designed solely in digital form - the ready-made components of the future fighter were implemented and developed on the Su-35S platform. As a result the 4++ generation Su-35S was practically on a par with a fifth generation fighter across all its characteristics except the so-called stealth technology, right up to the moment it entered series production. 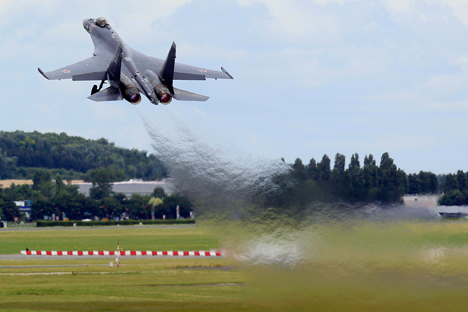 The Su-35S is capable of reaching speeds of up 2,400 km per hour and has a range of up to 3,600 km. It is equally confident as a fighter, a long-range interceptor and a missile-carrying bomber. Moreover in terms of certain characteristics the Su-35S has already overtaken the only fifth generation fighter to enter service to date the American F-22 Raptor. Thus, the ‘Irbis’ radar control system fitted to the Su-35S is able to detect an airborne target at a record distance of up to 400 km and of tracking up to 30 targets and engaging 8 simultaneously. The radar system on the F-22 is weaker: the maximum detection range is only 300 km. Apart from that the ‘Irbis’ provides the potential to actively detect and track up to four ground targets simultaneously. In addition the Su-35S is fitted with a navigation system capable of pinpointing the aircraft’s location and its movement parameters autonomously without resorting to satellite navigation or communication with ground stations. That is to say if the GPS or GLONASS were switched off the aircraft would not be ‘blinded’. The Russian Air Force is due to receive 48 Su-35S aircraft before the end of 2015. In practical terms that’s 50 fifth generation aircraft in as much as the Su35S is almost identical to the PAK FA in terms of the on board electronics suite, control systems and armament. Therefore it will not prove difficult for pilots to convert to the classic fifth generation fighter with its obligatory stealth technology: any pilot who has assimilated the Su-35S can easily convert to the T-50. This means that the conversion to fifth generation fighters does not start in 2017 - it is already happening now in the Russian Air Force. The ideology of the aircraft that will dominate the skies in the second half of the 21st Century is being determined today. Whether these will be flying robots or classic manned fighters with even more up to date electronics and new armament is not really important. The main point is that the Russian aircraft industry has a head start in developing a sixth generation fighter. The quicker the Su-35S enters service with front line units and the greater their numbers, the more successful work to create a new generation of fighter aircraft will be.